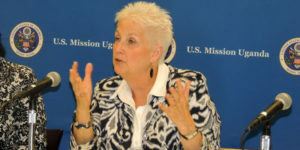 US ambassador to Uganda Deborah Malac. The US said it is deeply concerned about the arrests and raids that it said stifle the rights of Ugandans to free expression. Courtesy photo. The United States government through its embassy in Kampala city has condemned the ongoing arrest of political leaders and some locals over denouncing the lifting of the Presidential age limit. In a Tweet seen by this website, the US said it is deeply concerned about the arrests and raids that it said stifle the rights of Ugandans to free expression and tarnish the country’s image globally. “We are disturbed by reports of raids on NGOs. Infringements on protected rights under Uganda’s Constitution will impede the country’s development,” the statement reads. The US government is now asking the government to guarantee all its citizens freedom of speech, expression and assembly, without fear or intimidation. This morning, the Lord Mayor Erias Lukwago and other political leaders were arrested and taken to different Police stations. Former FDC Presidential candidate Dr Kizza Besigye has been blocked from leaving his home. Lukwago and KCCA councillors were planning to march to the Constitutional Square in protest of the move by Parliament to amend Article 102(b) of the Constitution to allow those who have clocked 75 years and above to contest for the Presidency. NRM legislators are today expected to table the bill advocating for the lifting of the age limit amid tight security at Parliament. The public has also been blocked from accessing the gallery for fear of possible chaos that might break out in the House. FDC offices are cordoned off while Action Aid International offices were raid by the Police this morning. Unlike in 2005, when the Parliament was lifting the term limit, this time, the population seems to be alert. Those in favour are jubilating and those against are bitter. Police boss Gen Kale Kayihura yesterday warned the public against conducting demonstrations. But in the morning, apart from the city, anti- age limit protesters in Gulu and Soroti districts were seen burning tyres in the towns while Makerere University students were by press time still engaging in running battles with the police.